Wolf specialises in the maintenance and repair of your hydraulically operated lifting cranes. From the largest ocean going shipboard crane to the knuckle boom crane on your platform, Wolf has the team of technicians, and suppliers to keep your cranes lifting. There is no job that is too big or too small for our service, installation and maintenance functions are performed by our trained and experienced technicians. Recognising the need for reliable and uninterrupted operations during maintenance our personnel will try to maintain operational capability as much as possible. The company and its personnel operate 24/7/365 servicing and maintenance of cranes. If you are involved in using cranes, you will know that repairs and services can be expensive but as every mechanic knows a bit of general maintenance can help avoid mechanical problems before they arise. By performing regular checks on vital components and parts you can help avoid unnecessary breakdowns. Our preventive maintenance programs can be custom tailored to the needs of your equipment and production. They will help maintain the investment in your cranes and lifting equipment as well as improve your production and plant safety. We offer simple quarterly services on equipment to complete full time on-site maintenance programmes. Our planned preventative maintenance program will be designed to meet your most demanding requirements. We offer both standard and bespoke contract solutions, with the length of terms starting from 3 months. Our time spent on site is devoted to reducing crane failures, prolong the equipments life and to maximise your equipment performance and reliability. We provide an extensive technical support service which has access to a broad database; we also have access to a vast range of spare components that ensures that we are able to provide contract solutions for all crane makes. Our engineers are updated regularly with training programs set up to ensure that we keep up with today’s technology. Small repair issues could be found during maintenance allowing them to be corrected before they cause failures of much more expensive components. Equipment life will be increased. Downtime resulting from unplanned failures will be reduced. 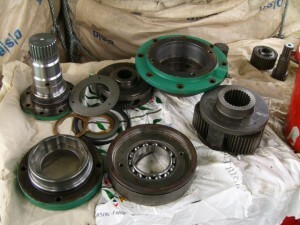 Equipment teardown and inspection to compile with manufactures requirements. On site plant maintenance personnel can focus more on production machinery.